Max Alexander Holshouser was born September 2, 1949 and turned 65 years old this week! I am blessed to be his wife of 43 years this December, 2014. We have two daughters, Margaret Anne Holshouser, originally called Maggie who decided she wanted to be called Annie about age 14; and Ali–Alexandra Kathryn Holshouser now married to Greg Orcutt with three children. Our family has been blessed a million times over by the presence of our intelligent, quiet, strong, independent, mild-mannered, Max Holshouser! Max grew up in rural North Carolina in the small town of Richfield. He played baseball and football, fished and studied. Max attended NC State University where he excelled in woodworking and majored in Industrial Arts Education. He first worked in industries more than education, among other things designing machines as a mechanical designer and draftsman. However, in 2001 Max returned to the classroom at Wakefield High School in Wake County, North Carolina where he taught CAD Drafting, Engineering, and Architecture for twelve years. While working in the professional world, Max raised two daughters and took care of a disabled parent, his Dad, the last seven years of his life. Max taught Sunday School, lead the youth group, and lead family camp retreats for his church at Western Boulevard Presbyterian Church. He served as a Legislative Chairman for almost every PTA in every school his children attended, until he stepped up to serve as President of the Wake County PTA Council, helping coordinate conferences and volunteerism throughout Wake County, North Carolina. Unfortunately, at fifty, his wife became disabled with heart disease and again he found himself the caretaker. All of these trials and tribulations, joys and adventures are part of Max Holshouser for sure, but he has another dimension to him that only people who get to know him realize–he is a craftsman with boundless talent! His abilities have brought immeasurable joy to our family and to others. He has gifted many of his accomplishments over the years, and I just have to tell you about the incredible talent Max Holshouser possesses, or better yet, show you! Happy Birthday my cherished husband, this is a tribute well deserved! Max catches huge fish in pond behind house. Max practices his catching skills. Max and Dad go deep- sea fishing. School pictures show growing up. Max plays softball with Power Systems and Controls team, 3rd baseman. 1984-Family with daughters Maggie 2, Ali 10. The family gathers at the Langhorne Reunion, Aug. 2014, Greg Orcutt, wife Ali with Evie, Helen, Liam, Max in red, Katy age 2, and Annie. Max with beloved 1967 Mustang! While he was a student at North Carolina State University, Max made an executive desk as his design project for his senior year. 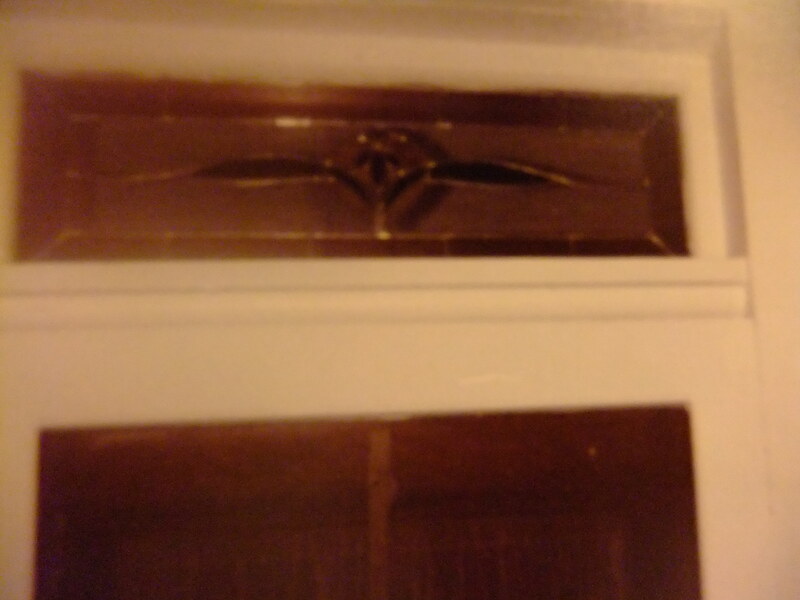 It was made from mahogany, and was beautiful. It was 6′ long, 3′ wide, and 30″ tall. The drawers slid in and out with total ease, and the wood was satiny smooth! I loved it! We moved it from apartment to house to house, with the rooms becoming smaller and smaller, and our children increasing in number, we just did not have room for it. Max gifted it to his sister for use in her upholstery business showroom in Myrtle Beach, SC. 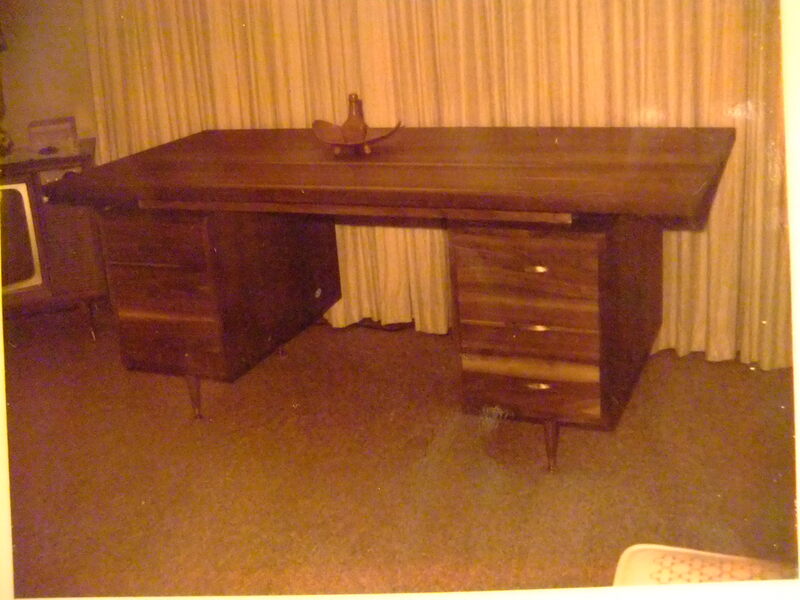 Unfortunately, in 1989, Hurricane Hugo hit and flooded her house and business, destroying the beautiful desk! 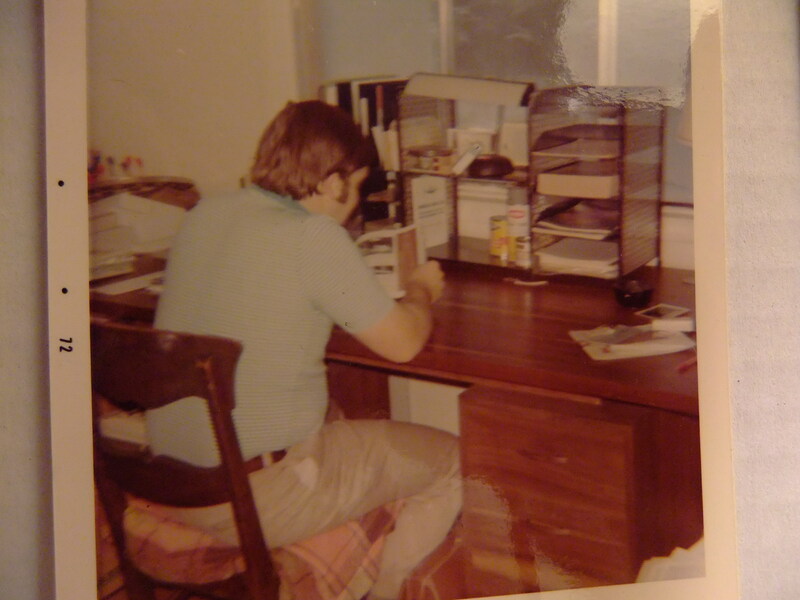 That hurricane had much worse effects on the family than the loss of this desk, you may want to read about it in this post. We married at Christmas in 1971. 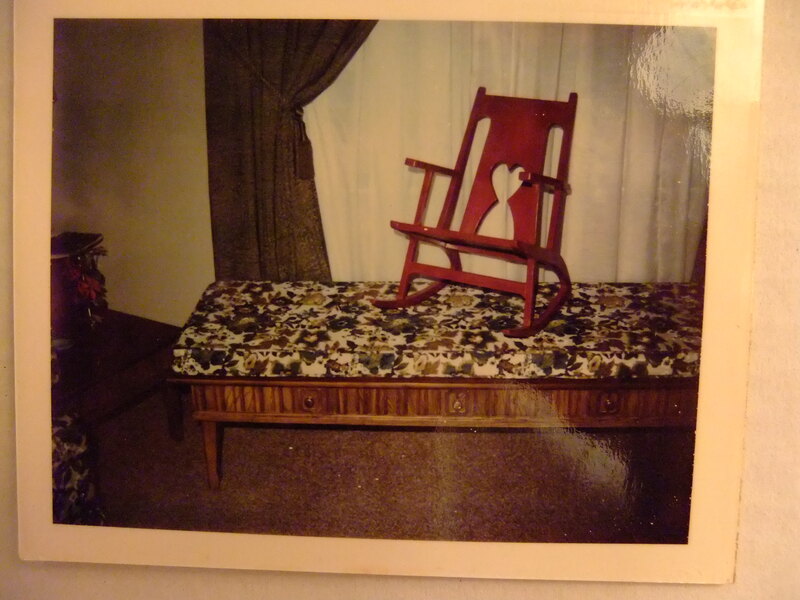 Max had been working on a rocking chair he was making for his niece Leslie. I remember it well, because, not only was it lovely, but he had to finish it on our honeymoon in order to deliver it by Christmas, 1971! 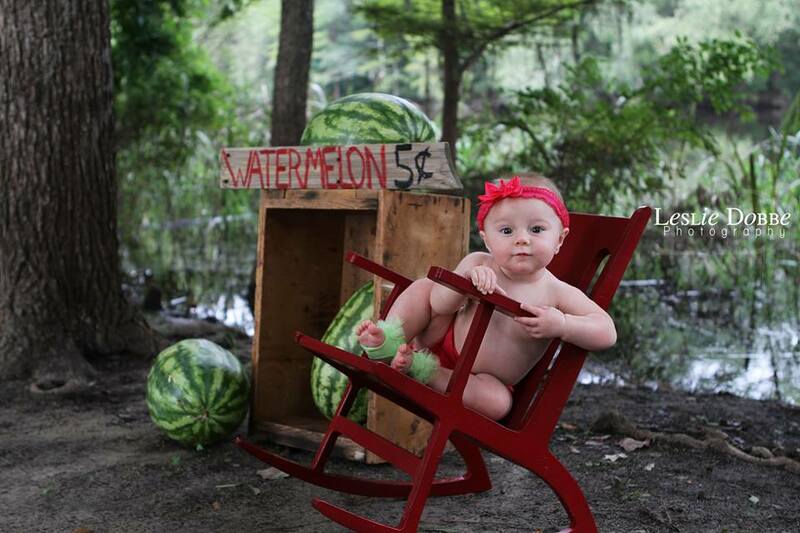 Recently, we received a picture of our great-great niece using the darling rocking chair Max made 43 years ago! 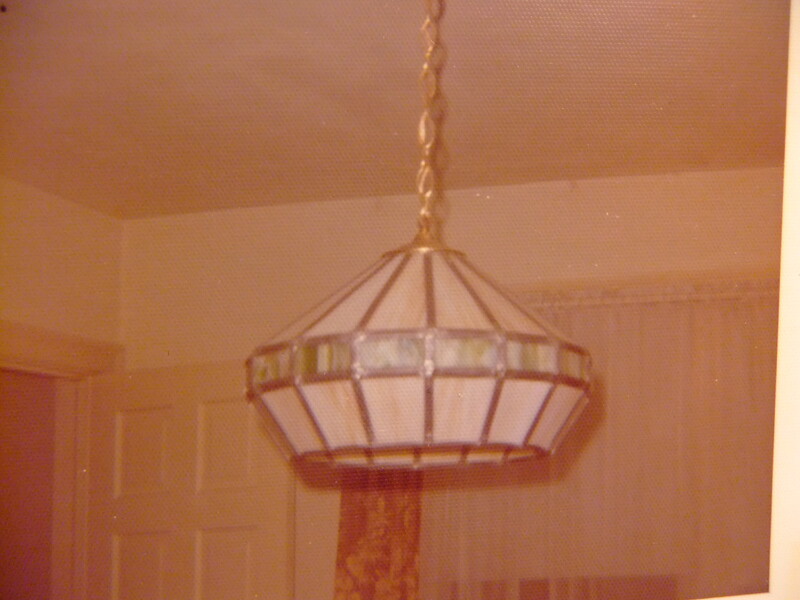 1972-1974, Max continued to make furniture, but he also started producing beautiful stained glass pieces. 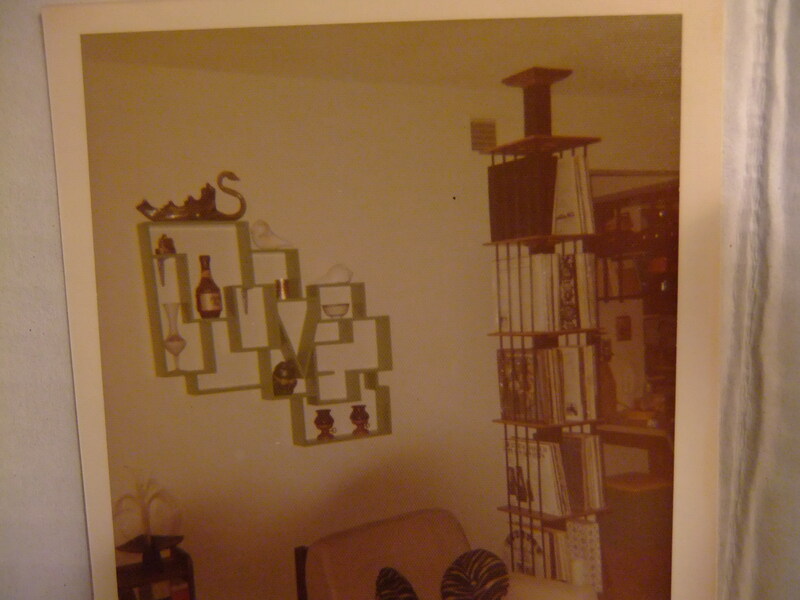 We lived in a modern apartment, and Max made furniture in primary colors to fit our lively, 1970’s decor! We had red shag carpeting, and faux fur cushions made by his sister Brenda Holshouser Goodman to fit the modern chairs he made! The chairs were black and white, and Max made geometric cubes for tables to match! We had a green and yellow decorative dividing wall between our living and dining room, which lit up softly at night, all designed and built by Max! On the wall was a what-not shelf in lime green that spelled out the word LOVE! How romantic a gift from my new husband! Thank heavens we loved primary colors, because a friend and artist, Dennis Anderson, had given us a wedding present of two 6′ x 4′ canvas panels he had painted bright green in geometric shapes! It was the 1970’s! 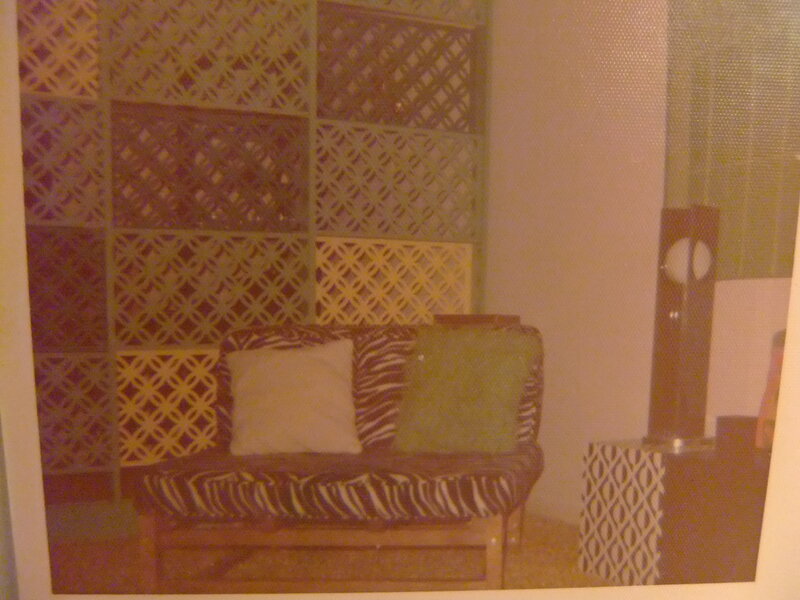 I always felt cheerful with that furniture! Max gifted my parents with many lovely items over the years, and his own parents as well. 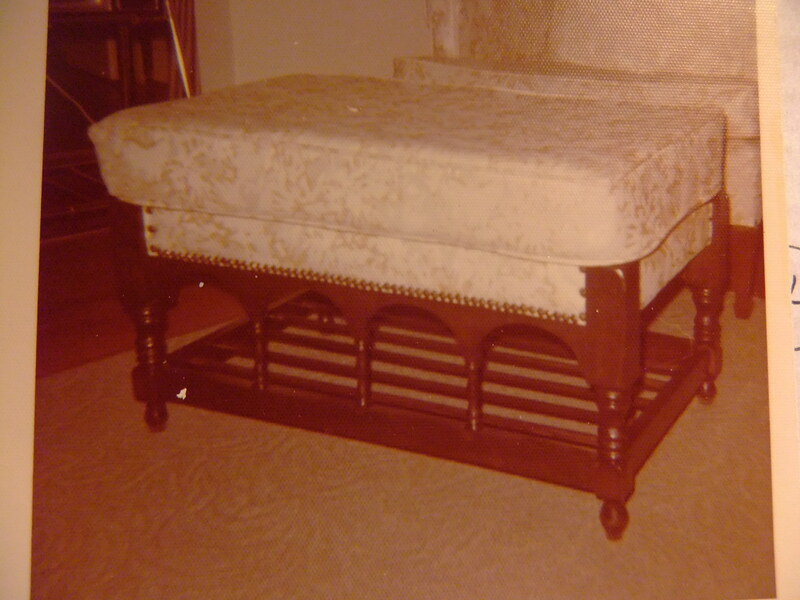 In 1974 Max made an ottoman for my mother to match a chair she had asked his sister to upholster. 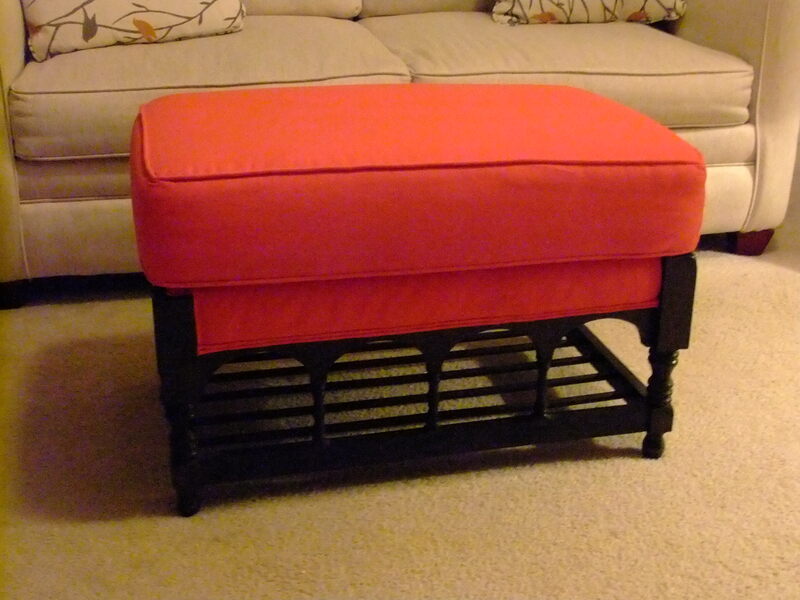 Brenda upholstered the ottoman to match! In 1973, the ottoman was white, now in 2014, my parents deceased, we own the ottoman which is still strong and sturdy and now covered in red by our talented Brenda of course! While he was in college, Max worked for a company that created and installed stained glass windows in churches. He enjoyed working with the glass so very much that he continued to create things throughout his life. 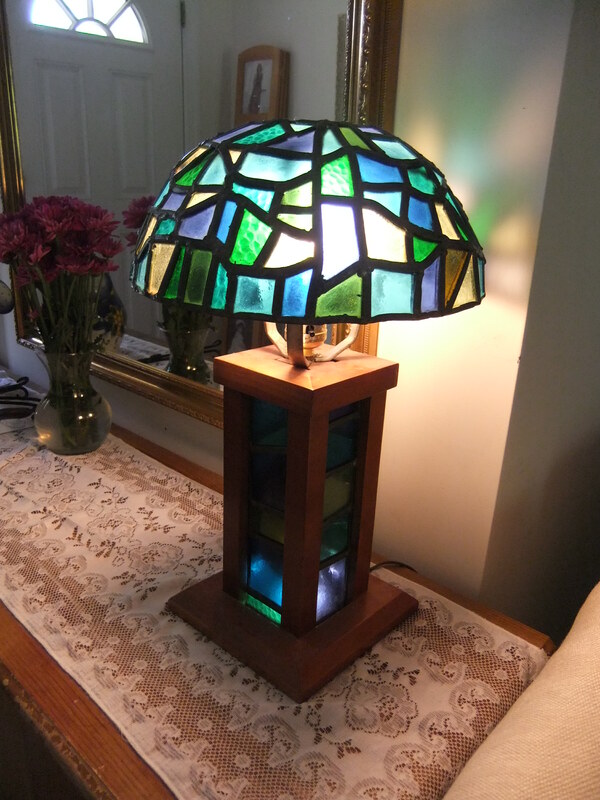 In 1974 he worked on several stained glass lamps that he then made more of and gifted to our parents, and our sisters and brothers. The first green one went to my parents and now hangs in my daughter Ali’s home. The red one went to Max’s parents, but now hangs in our living room as they are also deceased. 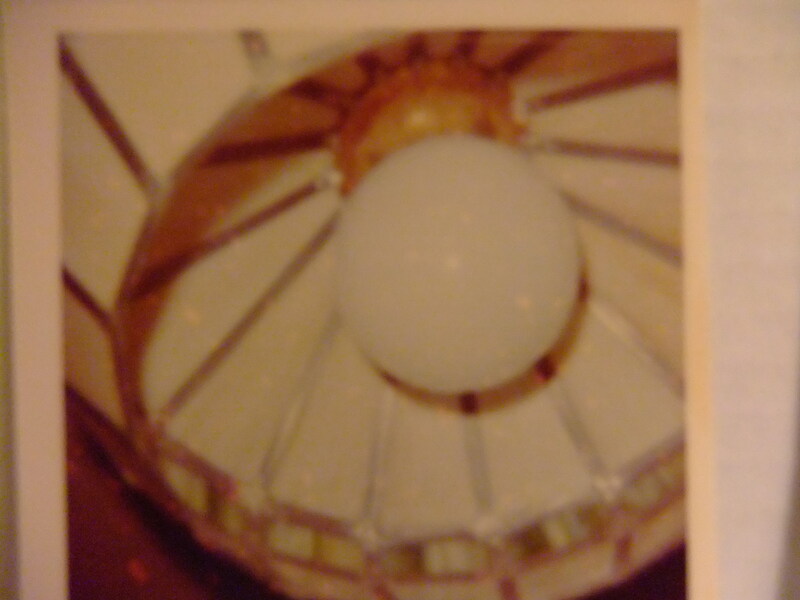 We have another blue stained glass lamp which was made originally for Max’s parents as well. It now sits proudly in our living room. 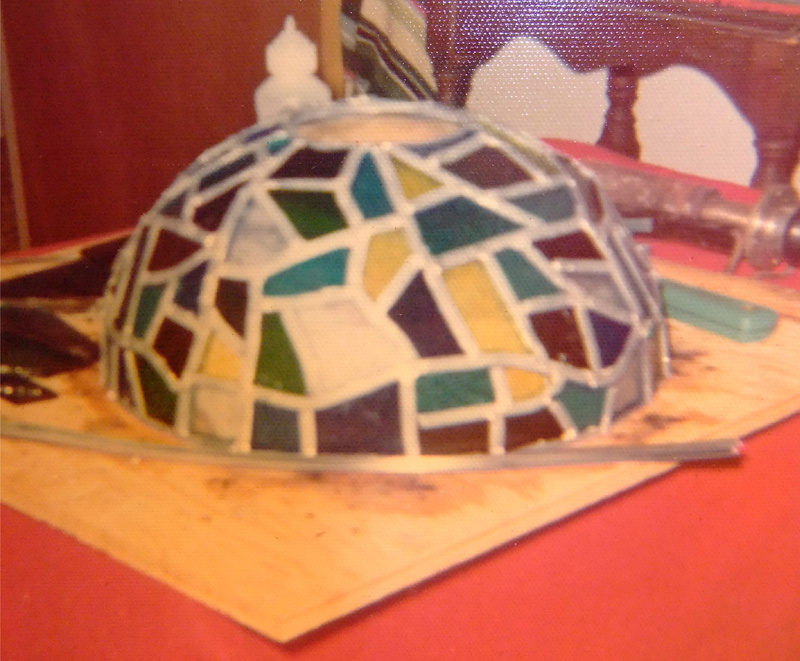 I remember watching Max create the mold to shape the stained glass globe around! It was amazing to watch it come together. 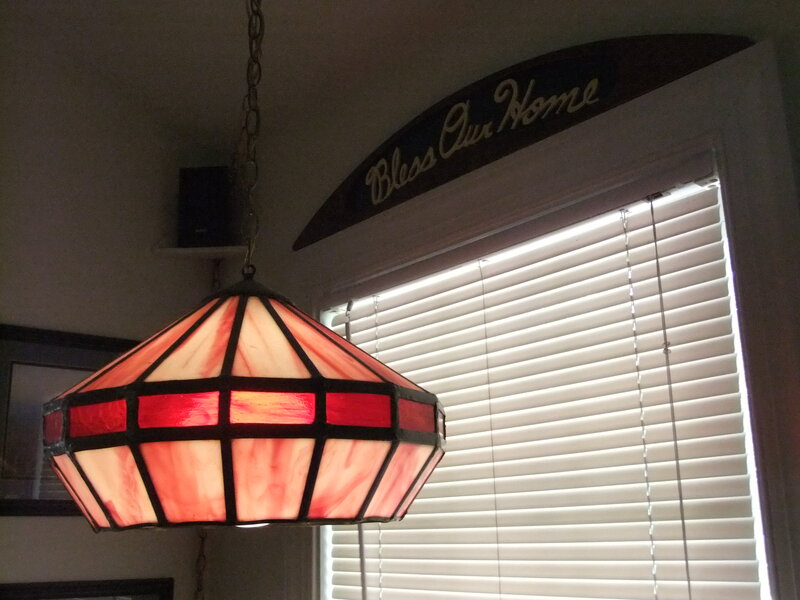 Over the years he made a transom window for some friends, and many small stained glass sun catchers. What a creative man! There is so much more I want to show you, I’ve hardly begun! I’d like to show you his string art, and his cross stitched designs that we have loved for many years! There are the decks, stone patio, and sheds he’s constructed! Then there are the toys: trains, planes, puzzles, and Noah’s Ark among others! Come back for chapter two! Isn’t it amazing how many gifts God gave this man, my husband Max?! Some people sing, some dance, some are great orators, Max is an artist, an artisan, an awesome man! Happy Birthday honey, I love you with all my heart. Click here for Part 2, Max A. Holshouser, Toys, Baking, and String Art! 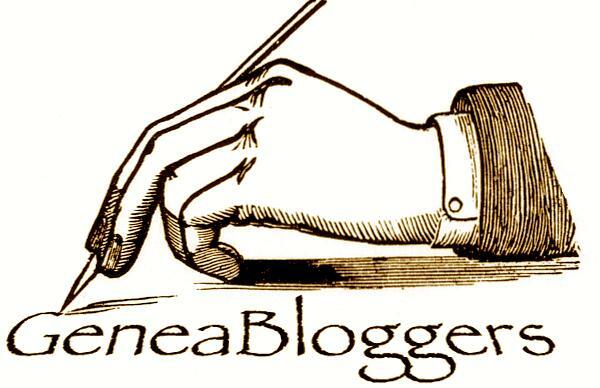 Categories: 52 ancestors' stories in 52 weeks, Genealogy, Holshouser family posts | Tags: 52 Ancestors in 52 Weeks Challenge, Artisan, Craftsman, Genealogy, Max Holshouser, stained glass, woodworking | Permalink. Helen, what a wonderful tribute to your husband. Written with love! Dear Linda, I was just looking out my red curtained window to see if you were out walking! Thanks for the support and constant encouragement! Thank you Cathy, I’ve been wanting to write about Max for a while. I want my great and great- greats to know who he is in his quiet abilities! Thanks for your comraderie. Very well done. This is a beautiful gift to your husband. However I get the feeling from reading this , that you and your husband have been each others gift for many years. May you enjoy many more. Helen I so enjoyed your story and can’t wait for the new chapters. I’ve enjoyed crafting through the years and enjoyed seeing his art. But I’m so jealous of that mustang! I also had one and so wish I didn’t sell it when I married in 71. So loved your story about this incredible man! I TRULY FEEL I KNOW YOUR FAMILY AND YOU ARE BLESSED Y ALL WHO KNOW YOU! Keep writing and gardening! You bring such great joy to all!